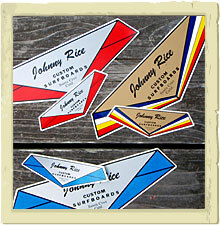 This is the place to get your official Johnny Rice Custom Surfboards gear. 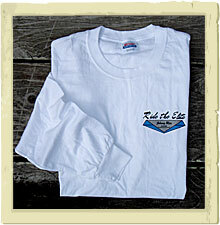 The premium cotton tees are perfect for the beach or kickin' it around town. 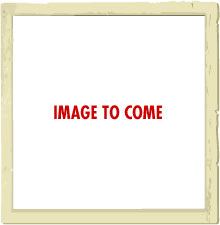 The sweatshirts are made of thick heavyweight cotton, and perfect for those chilly days when the marine layer rolls in. Our decals are printed with UV resistant inks and will hold up in all weather conditions. Stick one on your car window to show everybody what kind of board you ride! If you'd like to pick up any of these, just drop Johnny a line. 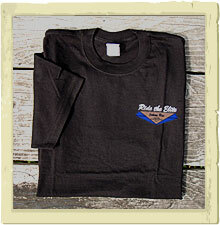 Small Johnny Rice logo with "Ride the Elite" script on front. Large Johnny Rice logo on back. Screen printed on 100% heavy weight cotton. 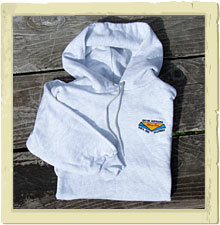 Small Johnny Rice logo on front with "CUSTOM SURFBOARDS, SANTA CRUZ, CALIFORNIA" text on front. Embroidered on 100% heavyweight cotton.